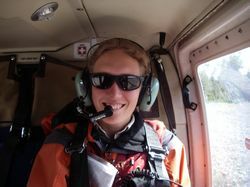 The second part of the two weeks were spent flying around in a helicopter checking different target points. Our pilot was John Danby. 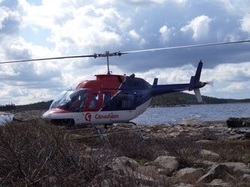 He had been flying around Labrador since the '70's and was a great tour guide. He had stories to tell for every area we covered. On our first day, we were dropped off to do a hike in the middle of nowhere. 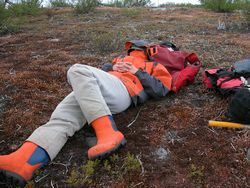 Had the chopper crashed, no one would have known where we were and it would have taken at least 3 days to walk to the road. Next time, we'll leave a map with someone with our locations. 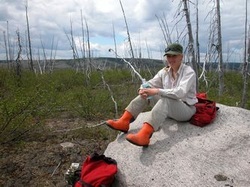 Eating lunch on the remote hike. As the pickup time came and went, I began contemplating the possibilities if we were abandoned. We didn't even have maps to get to the gravel road to the north. He did arrive eventually. We saw many beautiful views while hunting for the elusive uranium. 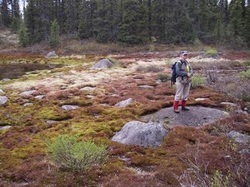 This one is the western border of the province. 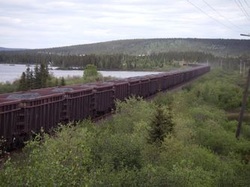 A train carrying iron ore pellets from Labrador City. 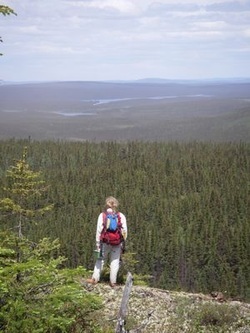 We worked our way from the western border to the eastern border of Labrador. This is Bedoin Canyon which is much more impressive in real life than in this photo. 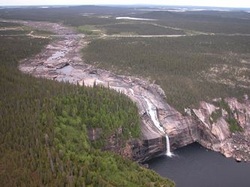 The Churchill Falls area was absolutely beautiful, most especially along the river. It was a huge river with massive canyon walls. 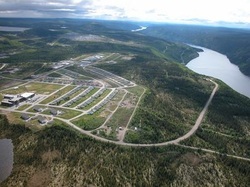 Churchill Falls is a strange little town. People tell you it looks like it came out of a kit, and it sure does. It is a company owned town and we were told you can't even live there unless you are working at the giant power station. The power station used to be the largest underground single grid power station in the world. I think China's new project is now the largest. 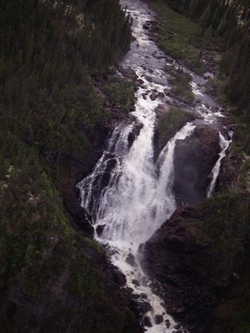 A tributary river to the Churchill River. 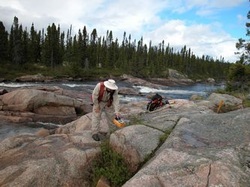 Tom checking out an outcrop in the Churchill Falls area. 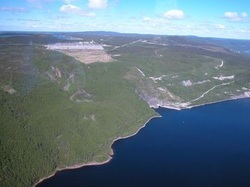 The Churchill Falls power station, if you look closely you can see where the water comes out after travelling underground.